Tabletop games are having a moment. The board game industry surges with record sales as players from around the world flock to tabletop games as a fun and interactive alternative to digital entertainment. Tapping into this interest are first-time entrepreneurs and experienced gamers, Margaret and Ken Kleist. The couple decided to turn their favorite pastime into a business with products for all ages and skill levels and a friendly, neighborhood atmosphere. Located at 954 Fulton St East in Uptown, Blue Bridge Games opened its doors in early February. The store welcomes newcomers and diehard gaming enthusiasts alike to play together as part of the tabletop gaming community. The spacious interior of Blue Bridge Games features an expansive inventory. Displays of new titles fill the front, a playspace with long tables stretches out in the back, and shelves packed with games line the walls. 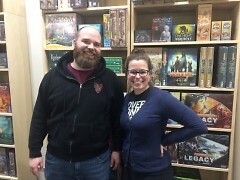 While the store offers classics like Clue and Candyland, the Kleists encourage new gamers to expand their horizons and try more recent games. Fond memories of lazy afternoons playing old favorites like Monopoly with their families stick with the Kleists. However, they appreciate how complex games have become since their childhood. Ken Kleist vividly recalls discovering Settlers of Catan as a student at Michigan State University and realizing how complicated games could be. Recent gaming trends radically alter the standard dynamic of two to four players competing against one another on a simple board. Legacy games use boards that permanently change over the course of each play session, while cooperative games involve players teaming up against the board itself to prevent the spread of contagious diseases or defeat cosmic monsters. These innovations allow large groups to develop collective narratives that can be returned to upon each replay. For those looking to check out new games without a commitment, Blue Bridge Games offers a game rental library. For a small fee, visitors can rent one of over 100 titles and try it out in the playspace. Store memberships permit overnight rentals, so players can borrow games to play at home, parties, or happy hours. Store events include walkthroughs of new games and a regular night of light, party games at City Built Brewing Company. Blue Bridge Games aims to lower the barrier to entry for new gamers. Game stores often develop cliquey cultures with players acting as gatekeepers and intentionally playing games with steep learning curves. The effort to launch Blue Bridge Games started in January 2018. Original plans went up in smoke when the first building caught fire, delaying a scheduled grand opening during the holiday season. Setbacks did not discourage the Kleists, who felt eager to secure a venue in a thriving business district bustling with active, curious residents. 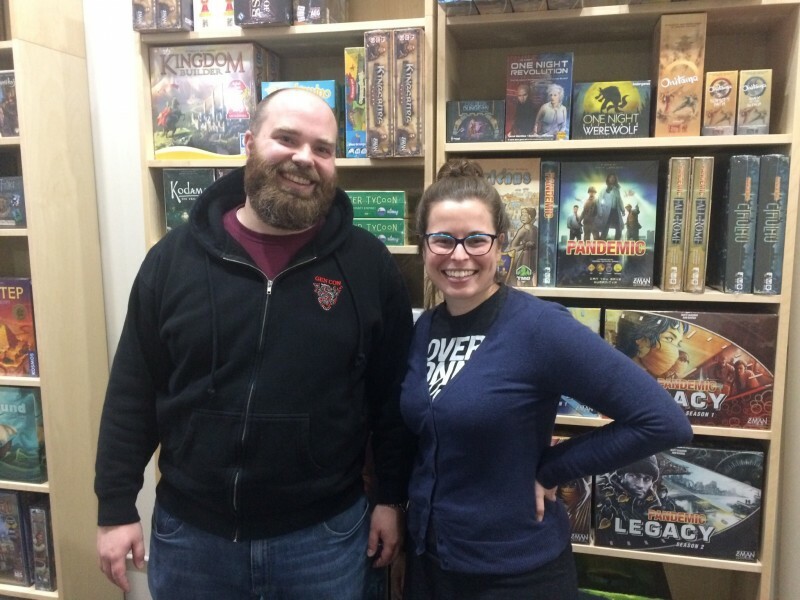 Their dream of starting an exciting new board game store was just beginning. “It’s been a labor of love,” said Margaret Kleist.